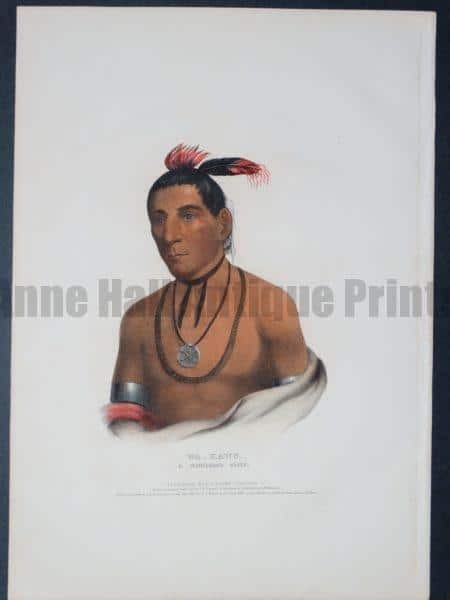 McKenney Hall – Wa-Kawn-Ha-Ka, A Winnebago Chief, $450. 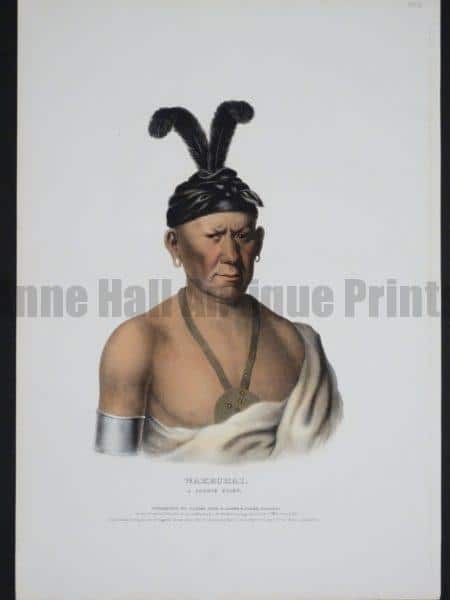 McKenney Hall – Shau-Hau-Napo-Tinia, An Ioway Chief, Unavailable. 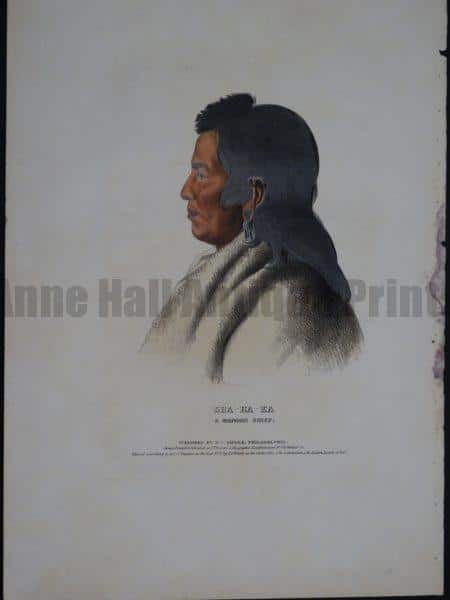 McKenney Hall – Sha-Ha-Ka, A Mandan Chief, $150. 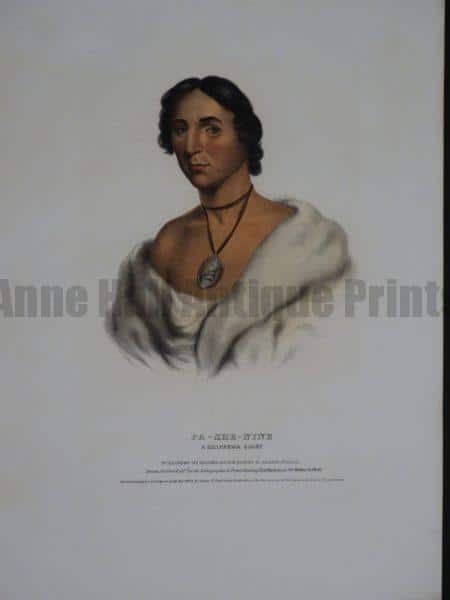 McKenney Hall – Pa-She-Nine, A Chippewa Chief, $300. 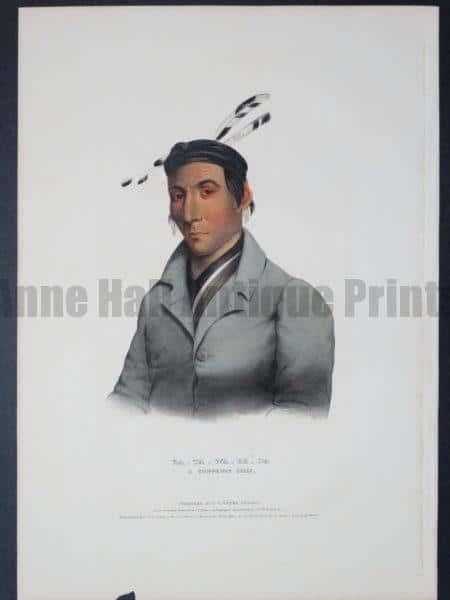 McKenney Hall – On-Ge-Wae, A Chippewa Chief, $300. 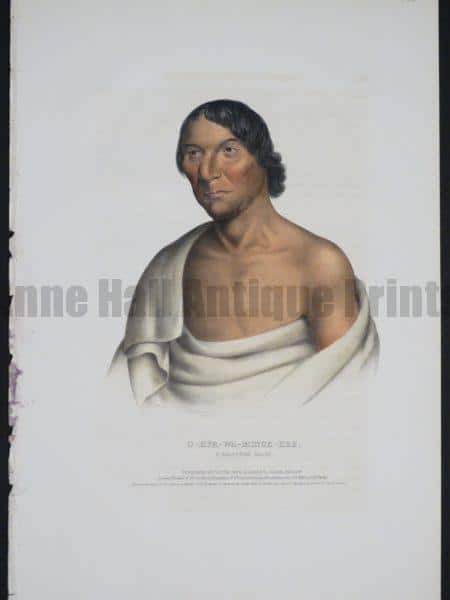 McKenney Hall – O-Hya-Wa-Mince-Kee, A Chippewa Chief, $150. 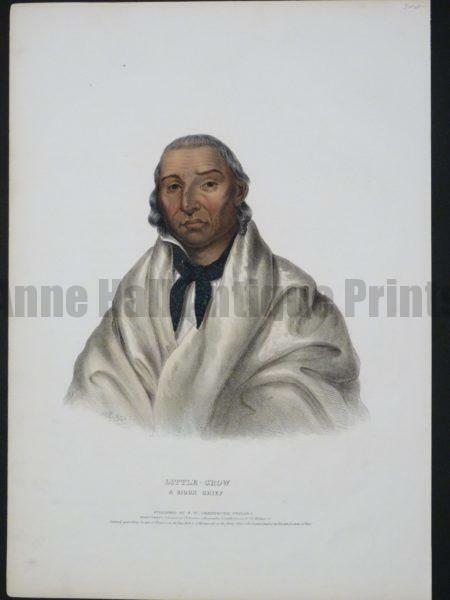 McKenney Hall – Little-Crow, A Sioux Chief, $300. 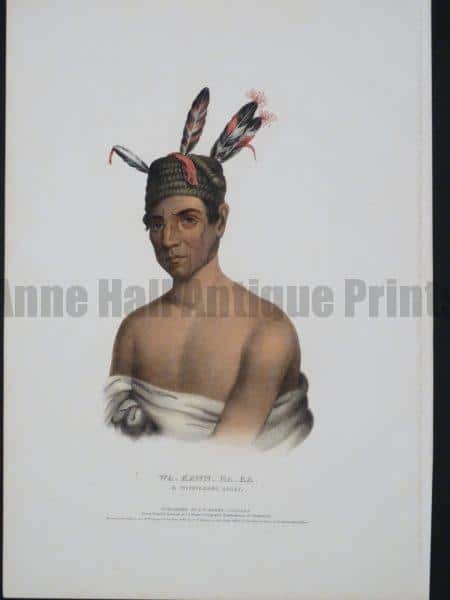 McKenney Hall – Ki-On-Twog-Ky or Corn Plant, A Seneca Chief, $1200. 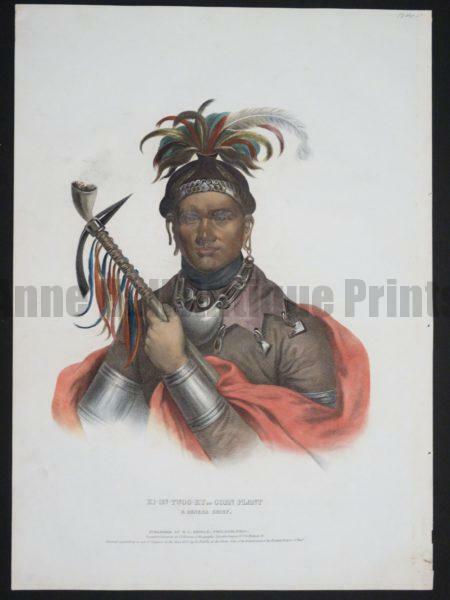 McKenney Hall Ka-Na-Pi-Ma, An Ottawa Chief, $300. 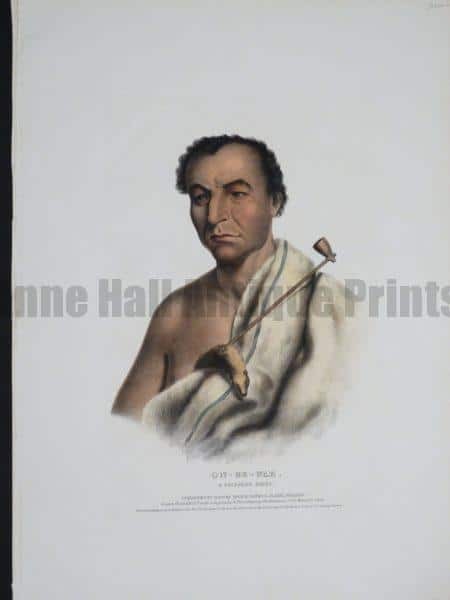 McKenney Hall – Wakechai, A Saukie Chief, $450. 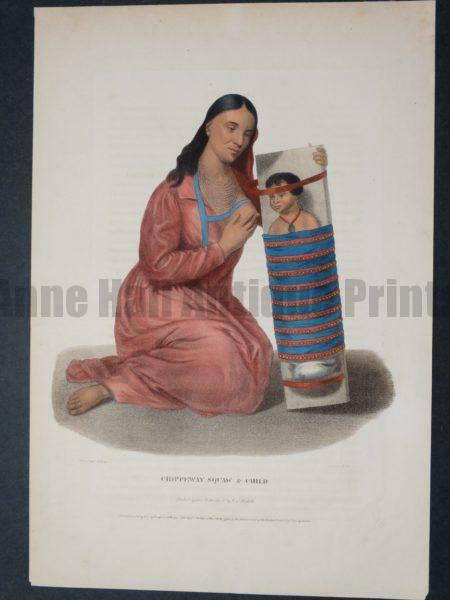 These lovely American Indian Antique Lithographs are the work of Thomas McKenney and James Hall. Coming from the books entitled:History of the Indian Tribes of North America. These magnificent, folio sized, 19th Century books were published in Philadelphia, Pennsylvania from 1837 to 1844. The text was written by James Hall. 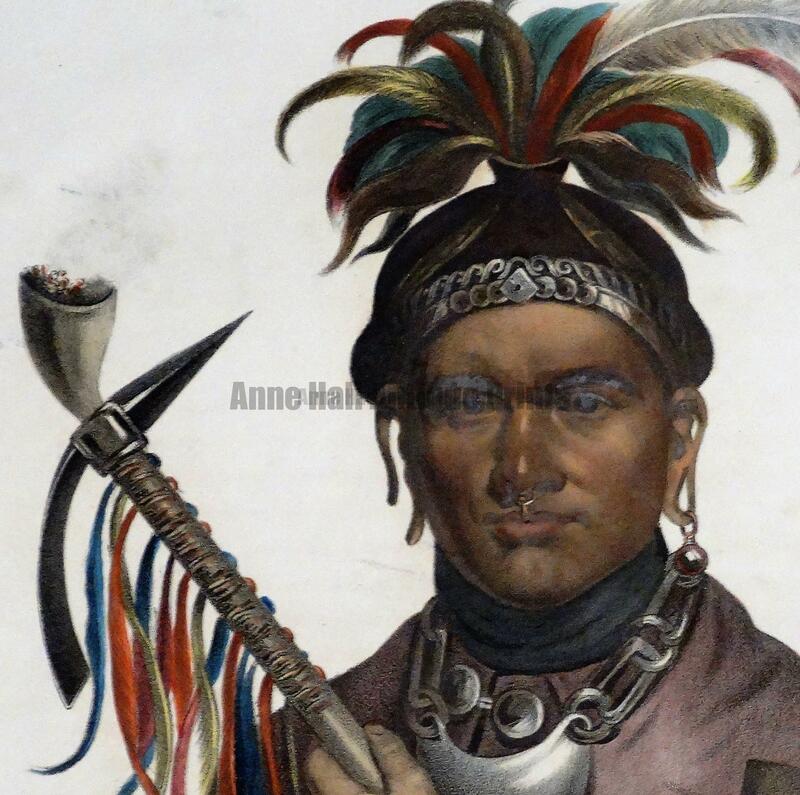 His partner was Thomas McKenney who commissioned the painters to execute the chiefs portraits in oil. These were the great chiefs that went to Washington DC for peace talks. The portraits were to be painted but not to be produced as book plates. Or so the Federal Government intended. So, one by one the paintings were snuck out of the archives and these beautiful hand colored lithographs were produced. Shortly after the original paintings were lost in the Smithsonian fire. 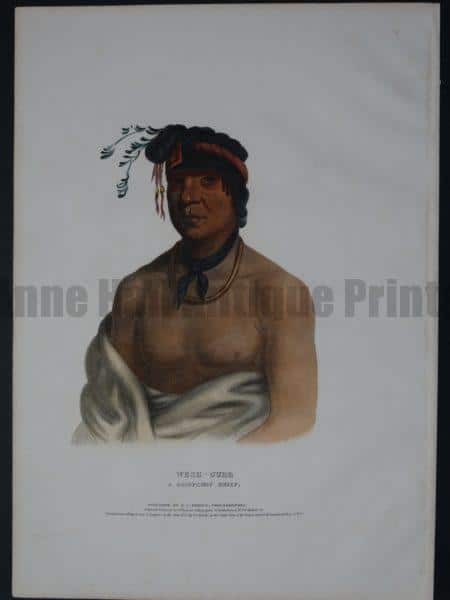 Each of these beautiful antique lithographs of American Indians measure about 14 1/2 x 19.” More are available, just inquire. Call 413-245-4197 or email: Click here to contact us. American Indian Art Pottery Bowls. Old Bureau of Ethnology Chromolithographs. American Indian Art! Old Pottery chromolithographs, published circa 1900 by the United States Bureau of American Ethnology. These old prints measure 7 1/2 x 11″. These are affordable chromolithographs, over 100 years old. $85. each or three or more for $75. each. Click here to contact us. 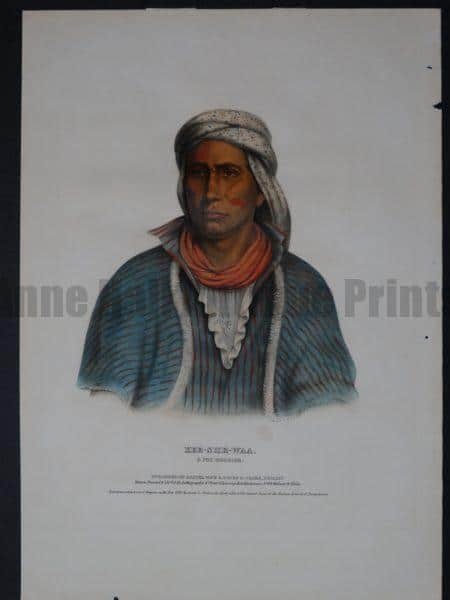 American Indian Antique Lithographs of Pottery. National Museum 1901. 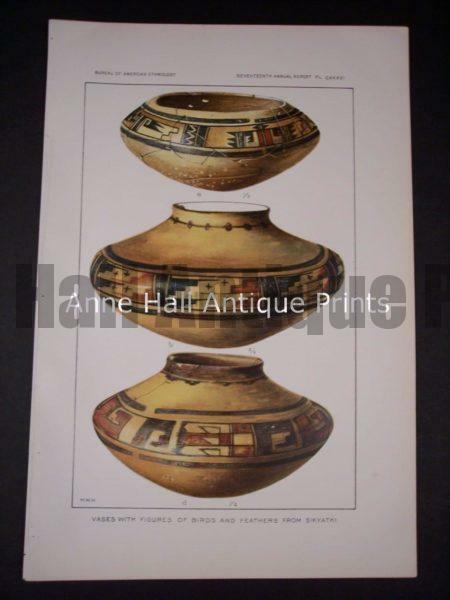 Antique American Indian Art Pottery chromolithographs produced in 1901 for the National Museum. These are all pots made by Arizona Indian tribes. 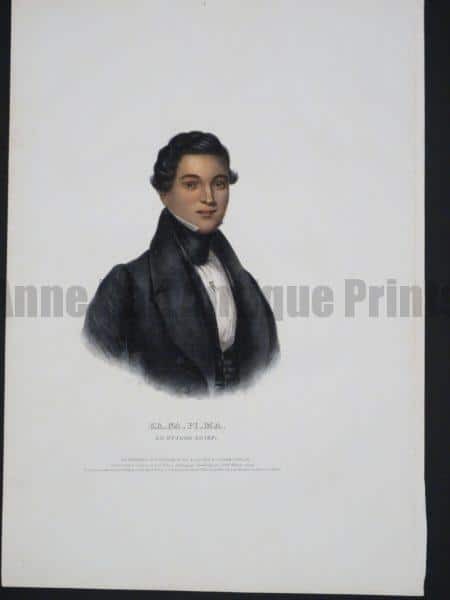 These wonderful old lithographs are in excellent condition. They measure 5 1/2 x 9″ and are $85. each. Click here to contact us. American West Buffalo Engravings, Framed, Sold as a Pair for $375. American Buffalo Engraving from 1802 Framed Pair $375. European Buffalo Engraving from 1802 Framed Pair $375. American Indian Head Dresses, Katchinas, Ceremonies. Chromolithographs. 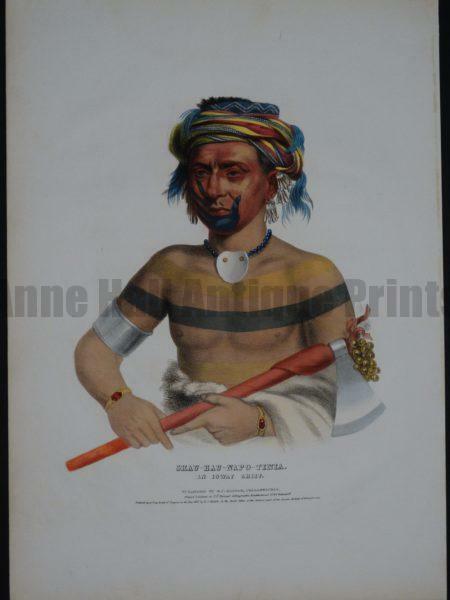 American Indian Antique Lithographs. American Indian’s head dresses and katchinas from the BAE. American chromolithographs produced for the US Bureau of American Ethnology. Produced c.1900, each old print measures 7 1/2 x 11″ and are $85. each $75. each if you order 3 or more. Click here to contact us. American Indian Antique Lithographs of Baskets from 1902. Hopi and other tribe baskets. These South Western basket chromolithographs are from 1902, look better in person, and measure 5 1/2 x 9″ and are $60. each. Click here to contact us. American Indian tribe basket. south western Indian basket Chromolithograph from 1902. American Indian Hopi tribe basket. south western Indian basket Chromolithograph from 1902. 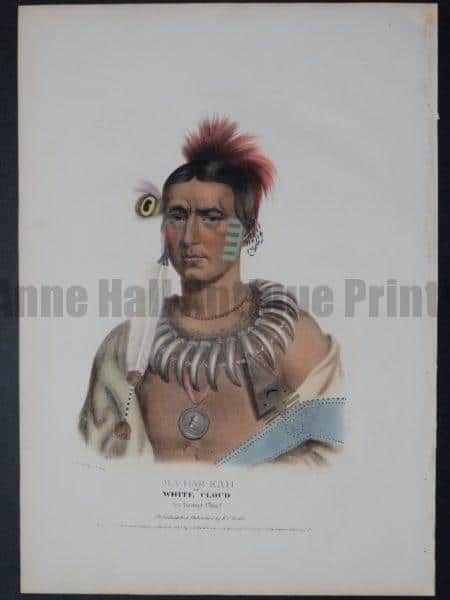 Native American Indian Antique Lithographs and Engravings. Own a piece of historic antique artwork and something that is pertinent to Early American. 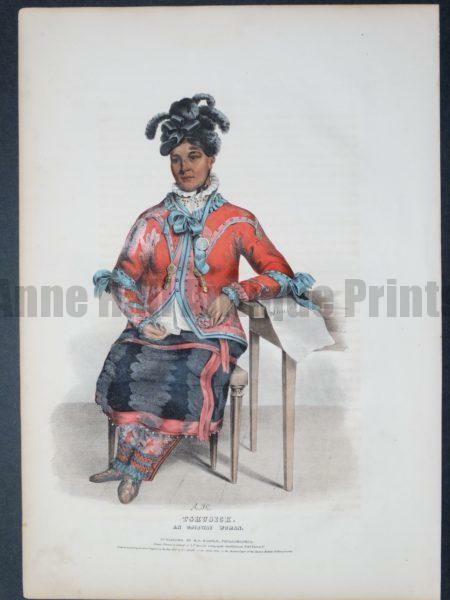 Indian and Western antique prints of subjects including Katchinas, Pottery & Basket prints. Our antique prints are all very old hand colored engravings & antique lithographs that were produced over 100 years ago. Early American scenes of the frontier and the Old West. 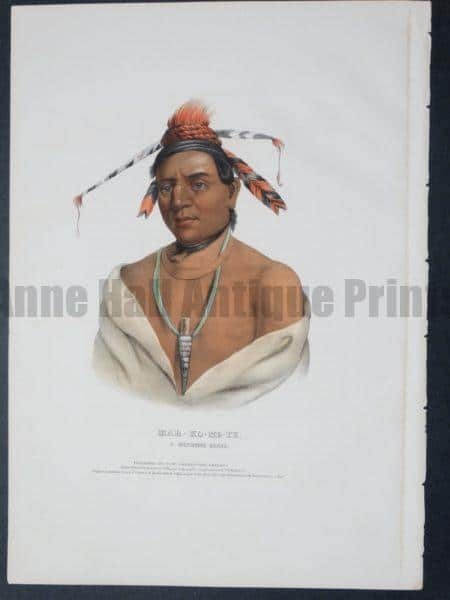 Antique prints illustrations of American Indian katchinas, head dresses, pottery, kivas, ceremonies, cowboy sheet music and more… Antique Prints of American Indians and Southwest American Indian Pottery and Baskets. Old engravings produced for early illustrated newspapers such as Harper’s Weekly & more!